Pack 29 events are ran COMPLETELY by volunteers. 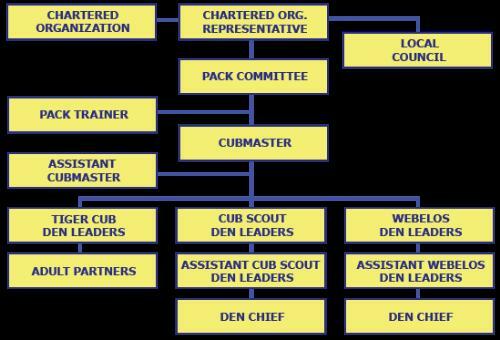 From Cubmaster to committee members, den leaders to task-specific volunteers, these people make the pack go! With more volunteers, we can maintain a fun and safe program without bogging down any one leader. Your help, big or small, is greatly appreciated. Pack 29 can ALWAYS use your help -- as a registered leader, or by serving on the committee for an annual event. ...any position you think would enrich Pack 29! Please contact Dave Corl for more information and to volunteer. The Boy Scouts of America has designed a program with specific leader positions to best perform the duties needed for a great scouting experience. Depending on Pack size and volunteers, some positions are absorbed by other leaders. Below is our Pack's Positions and quick summary of duties. Click each major position for more information. Cubmaster - Leads and Energizes the whole Pack. Helps den leaders do their best. Ensures a safe and fun yearly program is in place. Ensures recruitment program is in place and operating. Committee Chair - Leads the pack committee, responsible for the administration, oversight, and support of thepack program. Den Leader - Plans den achievement schedule for the year, ensures scheduled den meetings occur, helps each scout complete the required achievements, attends committee meetings. Popcorn Kernal - In charge of operation of fundraider. Communicates with district Popcorn Kernal, distributes related information and forms to Pack, energizes pack for popcorn sales, ensures deadlines are met, collects money, orders popcorn for pack, organizes pick-up and distribution. Time demand: August-December - August: training, planning, distrubution; September-November: Order form/Money collection & logging; November-December: Order and process popcorn and prizes, distribute to scouts., Pack meetings, committee meetings. Treasurer - Maintain Pack account, write checks and make deposits, generate monthly reports to committee. Advancement Chair - Log in scout advancements into council register, purchase and distribute awards/patches/pins to den leaders. Camping Chair - Plan and organize Pack camping events, ensure health forms completed and submitted, ensure all permits completed. Blue and Gold Event Planner - Plans and budgets the February Blue and Gold event. Pinewood Derby Track Crew - Helps with January Pinewood Derby event. Track setup and troubleshoot, operating computer bracket system. Community Service Chair - Plans cub scout level community service projects. Assistant ______ - Any position can use an (official/unofficial)assistant that can provide an extra hand and/or back-up. Time demand: less than if you were leading the position alone! Other - There are many other major/minor positions that can benefit the operations and energy of the Pack. Some positions are: Photographer, Webmaster/Facebook connection, Craftsperson, Event planner, Recruitment chair,... If you know a position that will make this pack better, we want to know! Dave C. / Nicole L.
The best way to thank those who volunteer is to volunteer yourself! Dave C., Matthew J, Jordan Z.
Dave C., Matthew J, Alva P.
Dave C., Matthew J, ? ?